Supraprimates, AKA Euarchontaglires, including rodents, rabbits and primates. In the Clades game, the mammals of the land are represented by suprapimates, also known as Euarchontoglires. 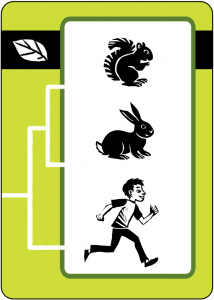 A squirrel represents rodents, a rabbit represents lagomorphs, and a child represents primates. Like most sorts of mammals, these animals diversified soon after the non-bird dinosaurs went extinct 66 million years ago. Rodents and lagomorphs are together in a clade called Glires, which is distinguished by front teeth that keep growing and growing. This adaptation allows these animals to chew through seed shells and wood without wearing out their teeth. More than any other order of mammals, rodents have diversified into many species, including unusual types such as flying squirrels, beavers, porcupines, capybaras, and naked mole rats. The sister clade to Glires is Euarchonta, which includes three tree-dwelling clades: tree shrews, colugos, and primates. Some primates live exclusively in the trees, while others climb trees to avoid predators. Two million years ago, however, our lineage lost its apelike shoulders, suggesting a shift away from tree-climbing to a life fully on the ground. Those Homo erectus ancestors gave rise to several species of human that spread out across the continents, including our species, which appeared in Africa 200 thousand years ago. We are the most successful large animal on Earth, at least for now.